Who Are The Demonstrators Who Stormed Iraq's Green Zone And Parliament? : The Two-Way The demonstrators are mostly supporters of fiery Shiite cleric Muqtada al-Sadr, who has had a fraught relationship with the U.S. They're calling for the government to follow through on its promises. Supporters of Shiite cleric Muqtada al-Sadr storm parliament in Baghdad's Green Zone on Saturday. Highlighting the simmering political tensions in Iraq, hundreds of protesters stormed Baghdad's heavily fortified Green Zone Saturday and entered the country's parliament. The breach of the Green Zone, which houses Iraq's ministries and the U.S. Embassy, is "unprecedented," Reuters says. Most of the protesters are supporters of fiery Shiite cleric Muqtada al-Sadr, and the breach happened after deadlock in parliament continued to delay government reforms. For now, at least, the demonstrators are withdrawing from the area, Reuters reports. They have vowed to "return by the end of the week to keep up the pressure" if their demands aren't met. This comes after an order from Prime Minister Haider al-Abadi to "arrest and prosecute those among the protesters who had attacked security forces, lawmakers and damaged state property after breaking into the Green Zone," The Associated Press reports. Video from the demonstration shows hundreds of protesters waving flags, cheering and chanting inside the parliament building. A statement from the U.S. Embassy in Baghdad says the demonstrations "included property damage and violence against some individuals." The protesters appeared to make themselves comfortable during their time in the Green Zone; a Washington Post reporter noticed demonstrators enjoying a swim during their sit-in. These are not straightforward anti-government protests. 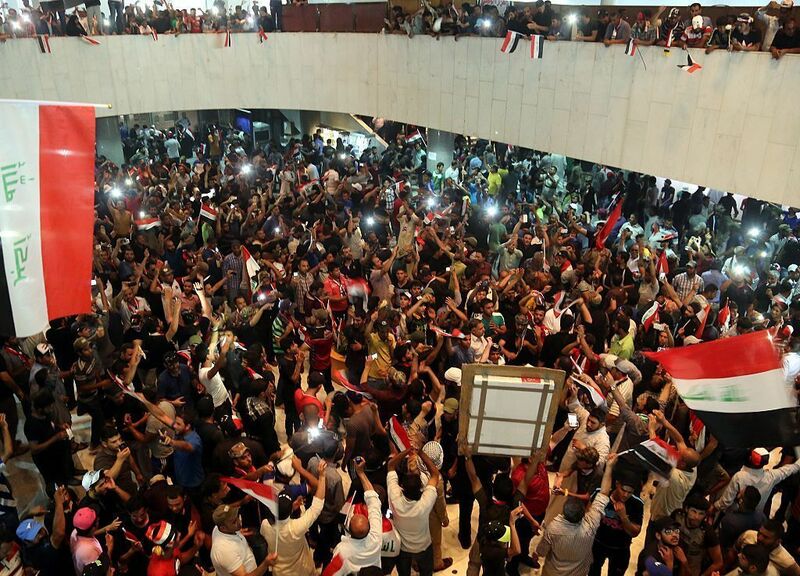 The demonstrators are instead calling for Abadi to follow through on wide-ranging government reforms, including "measures to end sectarian quotas in politics and fight corruption," The New York Times reports. The protesters also want to see technocrats replace politicians in several Cabinet positions. The Times adds: "Rather than pushing for the ouster of Mr. Abadi, they have largely supported the prime minister as he has sought to make good on promises, still unfulfilled, to improve how the government works." The newspaper adds that "politicians dependent on patronage and government perquisites" have been obstacles to carrying out these reforms. If you remember, Sadr's Mahdi Army — an "anti-government, anti-America militia," as NPR has described it — rose up in 2004. As the war continued, the group became increasingly sectarian and "was behind some of the most brutal killings during those years." Sadr returned to Iraq from self-imposed exile in Iran in 2011, appearing more open to working within the existing political system. Since then, alliances have shifted. NPR's Alice Fordham has reported that the Mahdi Army — now called the Peace Brigades — is fighting on the same side as the U.S. against Islamic State militants. It's a reality that "all sides involved have reservations about," as Alice reported. Then came Sadr's major political reemergence in February, criticizing government inaction on reforms. As The New Yorker writes, "Sadr knows how to choose his moments, and earlier this year he was back in the news, after a long and unexplained absence." He's been rallying his supporters at protests sometimes hundreds of thousands strong. "At the least, [Abadi] knows he will have to contend with Sadr in order to retain stability on Iraq's streets, and power for himself. In the rumbustious mosh pit of Iraqi politics, knowing how to survive is everything. 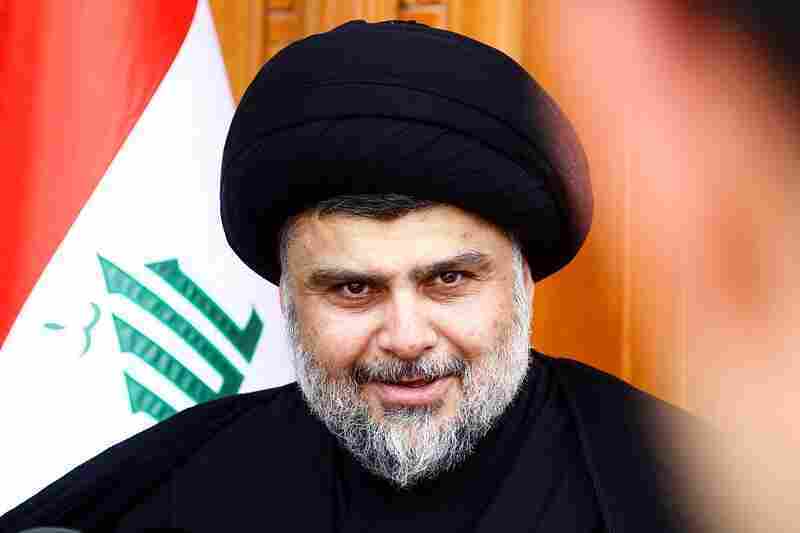 At the rate he is going, Moqtada al-Sadr could well end up as the last man standing."